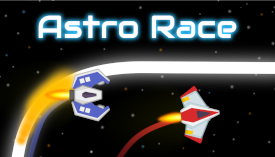 Astro Race | Play Astro Race free on iogames.space! Somewhere in space, this may all be happening right now. Rev up your auto-thrusters and engage your war drives, space racing is here. Drive a supersonic spaceship and fight for the pole position against other players in this super fast, super futuristic, MMO racing game. With judicious use of the boost function, you can blast ahead of other players and take the lead, keep it with aggressive driving and score gold to be the best of the day. Drift along the track borders to speed up and recharge your boost, knock into other players to keep them off their game, be aggressive, be a winner! Reach the highest league and compete with the most furious players in the world! Astro Race is the first drifting and racing IO game available!